In this episode, Ken gets a little Latin lover while Yolei and Sora are introduced to Yuri. It's not as awesome as it sounds, but it's close. 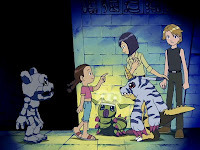 Let's recap this episode quickly: we've got kids sneaking into Mayan ruins, an adorable little girl getting into a Mexican standoff with Wormmon, a crazy awesome language barrier scene leading to a crazy awesome way of commanding troops, capped off by Yolei and Sora getting sent to Siberia just for the hell of it. There's enough going on here to make up for cutting out a gun getting pulled on Matt and Ken. It's a shame that one cut scene, consistent with standards & practices of that era, overshadows the rest of the episode, which is totally goofy and puts a nice cap on what had been a totally goofy mini-arc. The dub even does a passable job covering for it, giving Ken a minor note of angst when the guard calls him a punk. If you didn't know ahead of time, it's hard to tell it was even there, which is a mark of success for this sort of thing. After Mexican Gennai clone Jose distracts the guards in the stupidest way possible, with the guards falling for it in the stupidest way possible, the kids sneak into the cave and Wormmon freaks out. This is a lovely episode for Wormmon as everything we've seen regarding his obsession with Ken has been tragic. Here it works for comedy as well, as he immediately goes into defense mode as young Mexican digidestined Rosa starts fawning over his partner. The Rosa/Wormmon battle is just plain cute. Rosa's aggressive in going after Ken, hostile to Wormmon and prone to spouting random bits of Spanish to tweak him. It's amazing how many facial expressions you can get out of that little guy when he's seriously pissed and the scenario's not all that dramatic. Rosa, of course, is an innocent little girl in the end and falls for Stingmon after he saves the day. The random bits of Spanish are worth commenting on, since it's a rare chance for the dub to handle the setting more comfortably than the Japanese version. Ken knowing a little Spanish in the dub isn't quite as savant-like as it's made out to be originally, and the dub assumes kids have watched enough Sesame Street to pick up some of the basic words. The dub also wisely renames her Rosa instead of keeping the original as Chichos is a godawful name for a little girl. Almost makes up for the gun scene right there. Speaking of languages, neither Yolei nor Sora speak Russian and that makes the Moscow exchange hilarious. While Tai and TK had a translator and Ken knows enough to get by, the girls barely know where to start. They introduce themselves to Anna, Sonya and Yuri (Anna... Sonya... Yuri...), share hugs... and promptly run into a brick wall. Since the only words Sora knows are foods, they use those as commands to take out the swarm of Flymon and save Moscow. Then Gennai clone Ilya shows up and sends the girls to Siberia. That's just unfair. By this point, the Siberia scene is just a downer as Sora and Yolei are cold and miserable, with Digimon tired from flying the hundreds of miles out of Moscow to get there. It's almost dramatic for a bit as it becomes a race to see whether the girls die from exposure or from falling off their Digimon. Imperialdramon rushes in to save them, which is a bit of a cop-out (and doesn't make Sora or Yolei look all that great) but sets up a fun scene where the girls want to go back to Moscow to eat borscht and flirt with Yuri. Sora's new boyfriend is not amused. Oh, and with Japan unguarded, Arukenimon and Mummymon have been enticing random children for some illicit purpose. More on that later. Lost in the conflict between Rosa and Wormmon is Rosa's partner Gotsumon, who is pretty awesome in his own right as he's quite embarrassed for Rosa and tries to help out Wormmon. He's also one of the few Digimon belonging to non-primary characters to get a full-blown evolution sequence. Michael's Betamon is totally jealous. I'm not entirely sure if the dub had Rosa's parents say “eres tú” because it's a phrasing viewers may be familiar with or as a reference to the inexplicably popular song. At first I didn't notice the control spire in Moscow because it blended in so well with the Russian architecture. Using piroshki and borscht was pretty obvious, but caviar was really confusing as that's not a Russian word. I also noticed that Anna, Sonya and Yuri (Anna... Sonya... Yuri...) didn't offer to treat Sora and Yolei to that. As ridiculous as the piroshki/borscht/caviar battle was, it may be the single most faithfully translated scene in the dub. Every word was spot on! Sora remarks that Old Gennai wouldn't have sent her to Siberia. No... he just sends her across the ocean on a shaky raft towards certain doom. The little montage of all the international friends at the end was cute and all, but does Derek ever wear anything other than that awkward man-kini? 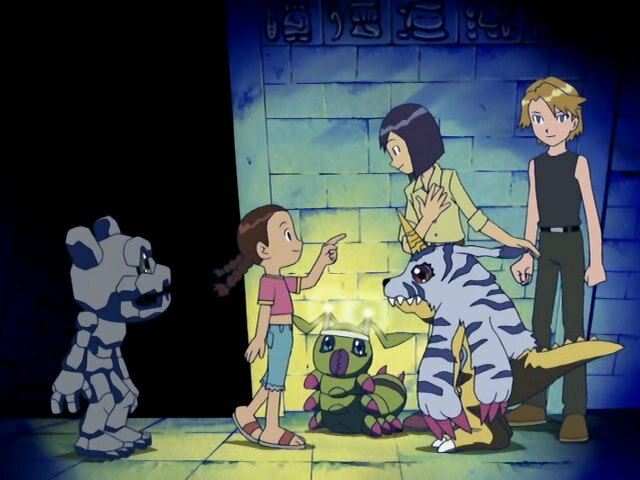 Wormmon's I'm-freaked-out-to-death scream = "WORRRRRRR"
There's a slight Taiora friendship moment when Sora mentions that she isn't going to tell Tai about the language barrier insanity. Maybe that's why they left it in English. English is just a translation convention for Japanese in the dub so for all we know the Russian kids heard "Ikura". worst arc had ever happened in Adventure, literally whoever wrote the "International chosen children" was dumb, this arc was boring to the core and had no importance on the plot overall, instead of working on Dark Ocean and Demon arcs we got stuck with 3 consecutive boring and bad episodes.